FREE for a limited time – Math Magician, an educational math app for elementary students developed by abc teach.com and VLinks Media. Recently updated, the app now has 4 levels – beginning, easy, medium, and hard. Several math concepts are covered within each level. The easy level covers counting 1-120, skip counting by 2 & 5, addition 1-20, subtraction 1-20, and greater/less than 0-20. The medium level covers: skip counting (10 and 100), addition 0-100, subtraction 0-100, add/subtract by 10, greater/less than 0-100, multiplication 1-10, and division 1-10. The hard level covers: addition 100-500, subtraction 50-200, multiplication facts 0-12 and division facts, 0-12. There are 35,000 multiple choice questions in all. 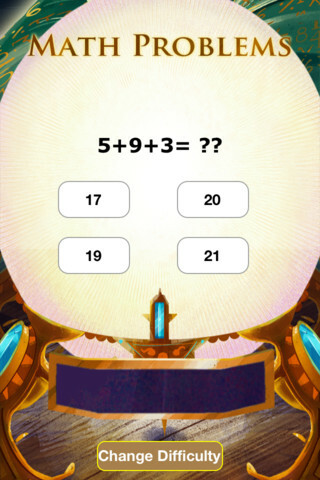 The object of the game is to use the power of numbers to help the magician regain his treasures. Kids do so by solving problems that appear in the Magic Crystal Ball. As they solve the problems, their progress is shown on the Magic Meter Bar. Once they have correctly answered about 20 problems, they unlock one of the treasures. This app provides lots of good math practice wrapped in a magical theme. 1.OA.6 – Add and subtract within 20, demonstrating fluency for addition and subtraction within 10. 2.OA.2 – Fluently add and subtract within 20 using mental strategies. By end of Grade 2, know from memory all sums of two one-digit numbers. 3.OA.7 – Fluently multiply and divide within 100, using strategies such as the relationship between multiplication and division or properties of operations. By the end of Grade 3, know from memory all products of two one-digit numbers. Keep reading my blog to find out when apps are offered for FREE.